Community feedback is being sought on a NEW eight-year strategy to guide the management of Mallee rivers, creeks, lakes and wetlands over the next eight years (2014-22). The Mallee Catchment Management Authority (CMA) has worked with regional agencies involved in waterway management, local communities, Traditional Owners and other key stakeholders to develop a draft Strategy, which is now available for public comment. This new Strategy is designed to be a practical document that will guide priorities for investment and the efforts of our regional communities and agencies. It sets out which of our waterways are a priority for future management, and proposes strategic works programs to improve their condition. Community members are invited to review the draft Mallee Waterway Strategy and provide feedback during the one month community consultation phase - 7 May 2014 to 4 June 2014. Electronic copies of the document are available for download on the Mallee CMA website at www.malleecma.vic.gov.au. Alternatively, a hard copy can be provided by contacting our Waterway Strategy Project Officer Rachael Slorach on 03 5051 4377. A NEW tender program will invest more than $1 million in the region to help northern- Mallee farmers tackle weeds and control pest animals in areas of native vegetation. Under the Northern Mallee Habitat Tender, funding will be rolled out over five years to help farmers conduct weed and pest animal control within areas of native vegetation; fence off native vegetation from stock; plant native trees and shrubs; and establish conservation covenants. Landholders taking part in the tender will have the flexibility to nominate how much they want to be paid for undertaking works on their farms, with funding to be awarded to proposals that represent best environmental value for money. The tender program aims to protect habitat for native plants and animals by reducing threats such as rabbits, weeds and stock grazing. The tender is targeted to farmland in the northern and south-western areas of the Millewa. Anyone who manages land in the target area is eligible to apply. To take part in the tender program, local farmers need to lodge an Expressions of Interest by the 23 May 2014. To find out more, or to submit an Expression of Interest contact Mallee CMA Project Officer Jennifer McCamley on 5051 4346 or visit the Mallee CMA by clicking here. The tender program will be delivered by the Mallee Catchment Management Authority (CMA), which is funded by the Victorian Government through the Victorian Environmental Partnerships Program. 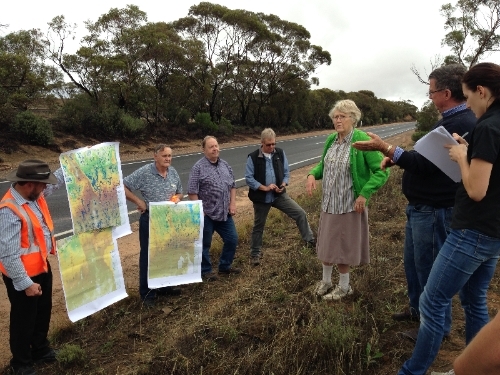 The Mallee CMA’s Land and Water Advisory Committee recently took a field trip to the southern Mallee, which gave members a chance to learn more about the area and the unique projects underway in this part of the region. Committee members discussed the Mallee Waterway Strategy and the associated regional works program; inspected a well established re-vegetation site on private land near Culgoa, which supports threatened species in the area; and viewed Barber’s Wetland, near Birchip, which was recently connected to the Wimmera Mallee Pipeline. Other topics discussed on the day included bushfire management; native vegetation management under power lines; the history and route of Dunmunkle Creek; and the Seasonal Watering Proposals developed for the region. The Land and Water Advisory Committee will meet again in June. The Mallee Catchment Management Authority (CMA) is coordinating environmental watering of two wetlands in the Kings Billabong Park. The watering will provide environmental water to Woorlong Wetlands (Basin 12) and Psyche Lagoon. Woorlong Wetlands has been largely dry since improved irrigation practices decreased drainage flows to the area. The purpose of providing environmental water to Woorlong Wetlands is to improve natural values and reduce the dominance of Cumbungi in the area. Lower Murray Water (LMW) is assisting the Mallee CMA by delivering water to Woorlong Wetlands through its irrigation and drainage infrastructure. The delivery of water is being managed by LMW to ensure it does not affect the availability of water for irrigators. Environmental water is also being delivered to Psyche Lagoon to improve the vegetation health of the surrounding Blackbox community and flush saline water from the lagoon, under managed conditions. The salinity impacts of the flushing are being managed under strict operating and monitoring protocols approved by the Murray Darling Basin Authority. LMW will assist with the operation of the Psyche Lagoon discharge gates to ensure that the flushing of Psyche Lagoon is carried out at the appropriate time. The environmental water has been made available from both the State and Commonwealth environmental water holders. For further information, please contact Louise Searle, Coordinator Waterways on 5051 4322 or 0427 854 885. 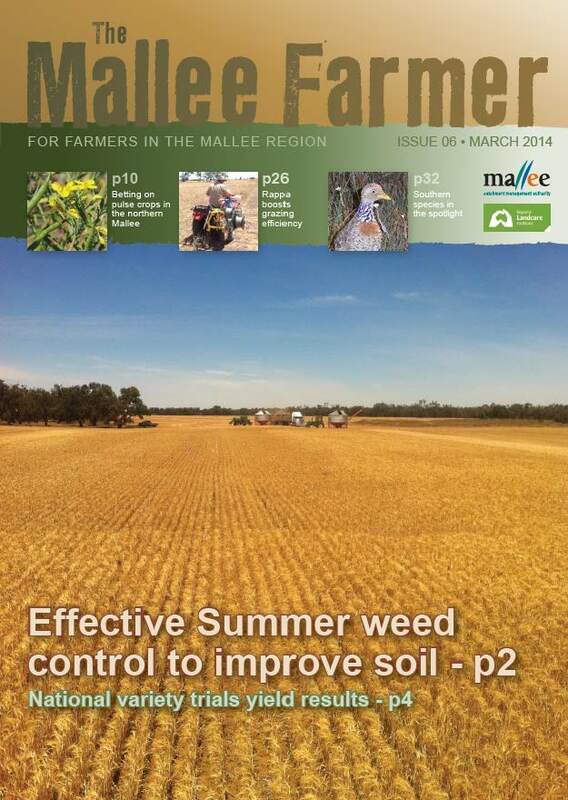 The latest addition of the Mallee Farmer is now available. If you would like to receive a copy or to be added to the subscription list contact the Mallee Catchment Management Authority on 03 5051 4377 or alternatively you can read it online at by clicking here. These projects are in the early stages of development. The purpose of these projects is to investigate options that will mean less water will need to be taken out of productive use to meet water recovery targets set under the Basin Plan. Mallee CMA is currently working on a proposal (Business Case) for each site. These proposals are to be finished by the end of the year (2014) and will then be considered by the Victorian Government, before going to the Commonwealth Government. Government funding has been provided to investigate these works and develop business cases, but the infrastructure itself has not been funded. Draft concept designs for each project have been developed, these will form a key part of the Business Case for each project. The draft concept designs are currently going through a consultation process with key project partners. Once the concept designs are finalised – which will help determine the actual extent of the works and what each project will involve – then more extensive engagement will take place, including considerations such as cultural heritage and biodiversity impacts. We are talking with key stakeholders, such as Indigenous stakeholders and irrigators, during the development process because we recognise the value of local knowledge, advice and feedback in successfully developing this project. For more information on these projects please contact the Mallee Catchment Management Authority on 03 5051 4377. You can now follow the Mallee Catchment Management Authority on Twitter, find out all the latest updates on upcoming programs and events by following us @malleecma.